_Fear and Hope artists and photographers connect fashion to the environment. 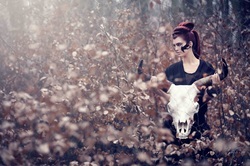 The photos use the themes “fear” and “hope”. The fear photos express death, extinction, and horror; the hope photos express friendliness, strength of nature, happiness, and love. As the project is built on a charity basis, contributions from external resources are crucial. They include, but is not limited to, time donated by models, photographers, hair and make-up artists, as well as clothing from designers.The value created at this stage is value-added in the Fear and Hope business model.